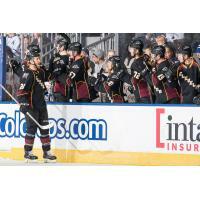 TORONTO, ON - The Cleveland Monsters, American Hockey League affiliate of the NHL's Columbus Blue Jackets, defeated the Toronto Marlies, 5-3, on Monday afternoon at the Coca-Cola Coliseum. With the win, the Monsters improve to 3-0-0-0 overall and remain alone in first place of the Eastern Conference's North Division. The Monsters struck first Monday against Toronto when Ryan MacInnis re-directed a Nathan Gerbe shot from Eric Robinson at 3:22 of the opening frame to give Cleveland an early 1-0 lead. Moments later, off a Toronto turnover, Justin Scott extended the lead with his second goal of the season, an even-strength tally at 5:33 of the first period to put the Monsters in front, 2-0. The Marlies responded at 15:49 when Chris Mueller scored on assists from Dmytro Timashov and Sam Gagner to trim the Monsters lead to 2-1. Michael Prapavessis capped off the scoring in the opening stanza with his first professional goal, an even-strength marker at 17:25 on feeds from Paul Bittner and Dillon Simpson to extend the Cleveland lead to 3-1 after one period of play. In the second period, the Monsters pushed their lead to 5-1 thanks to two quick goals from Zac Dalpe - the first, a power-play goal at 2:13 on feeds from Alex Broadhurst and Gerbe, and the second an even-strength tally at 4:30 with assists from Tommy Cross and Robinson. Toronto answered with an even-strength goal of their own at 4:46 as Sam Gagner scored on a feed from Carl Grunstrom. The Marlies closed the scoring for the day at 17:56 of the middle frame when Calle Rosen found the back of the net thanks to assists from Jordan Subban and Gagner, giving the Monsters a 5-3 road victory. Cleveland goaltender Jean-Francois Berube stopped 37 of 40 shots faced Monday to improve to 2-0-0 on the season, while Marlies backstop Kasimir Kaskisuo stopped 19 of 24 pucks to drop to 1-1-0. Next up for the Monsters, it's a Thursday home clash vs. the Wilkes-Barre/Scranton Penguins with full coverage, live from The Q, underway at 7:00 pm on Alt 99.1 and the Monsters Hockey Network.